Hope this list will come in useful for all those who’re planning on where to go for your wedding shoot. Seriously, Singapore is small and got nothing special lah! Wahahaha! The above are the best already. If you’ve got any other suggestions, please do share ya? Oh yes! I adore all photos by jOho! Need big pocket to have him shoot though. Save up Claudia! Previous Previous post: Come on a getaway with us! Next Next post: Do you remember your beansprout pillow? Wow, those photos of Marina Barrage are mega awesome. It looked nothing like that when I was there, haha! This is a good list, I’m imagining Emerald Hill would be perfect. Love that area. Congrats to your friend! I have two friends getting married in January too, and they’re my age! .-= Melly´s last blog ..Being park people =-. Melly! I want to go for shoot at Sunset Way’s railway too!! Let’s do it together!!! omg nice! useful! thanks claud! .-= Eevon´s last blog ..Shopping at Citygate Outlets =-. I was at a wedding photoshoot last week! We went to a hotel suite, botanical gardens, portsdown and raffles place to shoot. .-= nadnut´s last blog ..The end is near. =-. Nice list ! 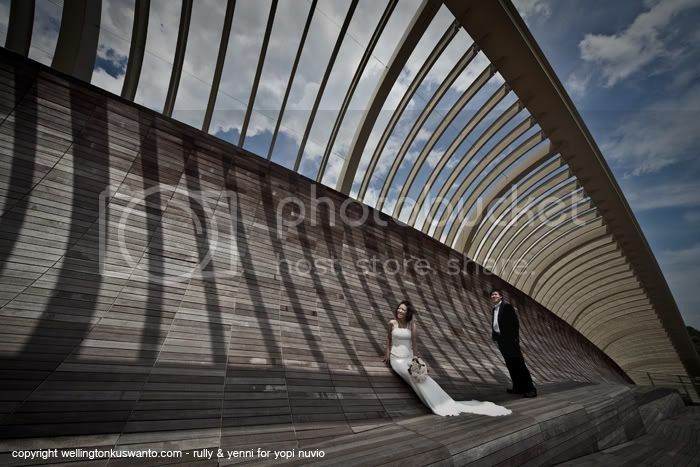 Recalled my outdoor wedding shoot experiences at Changi Boardwalk & Changi Airport T3 ! Had been to almost all the places for own photoshoot, Sunset Way Railway track would be a challenge for couples, I live near the area & know the surroundings. Come out for fun photo shoot ! Get the LG Photobloggers ! .-= JH´s last blog ..Don’t QUIT ! =-. I love the first shot at Marina Barrage. The last time I was there I was sweltering under the hot sun and I’d never think of doing a wedding photoshoot there, especially with the makeup and hair nicely done. Anyway, I heard that many people are going overseas for their photoshoots nowadays at places such as China and Taiwan. The scenery there is much better and they offer a larger selection of gowns at lower rates too. .-= Hui´s last blog ..L’Oréal Brandstorm 2010: Diesel =-. Wooo thanks for sharing. Haven’t heard of the photographer of the first photo. He is good! Nice location for weddings and also it is much beneficial. I like it. Also very attractive and a refreshing place for wedding. just to drop a note to show an appreciation of this post. it has certainly been really helpful, in fact one of the most informative post on out door photography in singapore ever..thank you.